Success stories worth emulating—the rose bush and the Rolling Stones. Part 1: When we moved into our current home, we inherited a yard that had 17 separate flowerbeds. Out of desire and necessity, Brenda (my beloved) became an avid gardener overnight. The gardens included many old rose bushes and Brenda became smitten with roses. Because the previous owner had neglected them, she quickly became a rose nurse, reviving a number of struggling rose bushes. One such rose bush stood along the stone walk that led to our front door. Brenda’s care kept it from dying though it never produced a single rose bloom for our first four summers here. 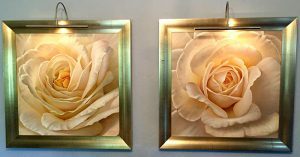 Part 2: That winter, while she was missing her rose blooms, she found a pair of magnificent paintings of yellow rose blooms. She hung them side-by-side in our front room, facing the windows overlooking our front walk. Part 3: That spring, the rose bush that had never produced a single rose burst into full bloom. Its yellow roses looked much like the blooms in her paintings. In the little fairy tale that I tell, it was as if the rose bush looked in the window, saw the beautiful rose bloom paintings, and said, “Oh! That’s what you wanted? Why didn’t you tell me? I can totally do that!” To this day, it’s still a thriving rose bush. It just needed a beautiful rose to emulate. Part 4: The Rolling Stones began as a cover band infatuated with the Chicago Blues. Their goal was to become the best Chicago Blues cover band in London. Whenever they could scrounge together enough money to buy an album of a Chicago Blues artist, they would play it incessantly, meticulously copying every chord, every vocal nuance, every guitar lick. In emulating their heroes, they never sounded exactly like the records, but their own Blues-inspired sound worked out pretty well for them. Both the rose bush and the Rolling Stones became great by emulating their heroes. Are you doing the same? You’ll never become exactly like them, because you’re not them. But in trying to imitate your inspiring heroes, you can become a much better version of yourself. Emulating greatness is a fast, cheap, and effective route to your own greatness. Listen to the story of any person who became the best in his or her field. Early on, they imitated their heroes. They never became as much like their hero as they’d hoped. But in the process of imitating, they became a brighter version of themselves. Who are the people you respect the most that you’d love to be like? If you can’t spend time with them, read their books and blogs. Research them. Watch their videos. Join their communities or teams. Read their stories or biographies. Then, do your very best to be like them. Imitation isn’t just flattery. It’s a great strategy. Who are you emulating? Tell us your story below – what heroes have you emulated and how did it make you better? The Mind to Win online program begins in May. Among other strategies, you’ll learn more about how to leverage your heroes to accelerate your own success. More information to come or let us know you’re interested. Thank you, Patsy. I’m happy it was a helpful reminder. Yes, so many great people to inspire us to be even greater.